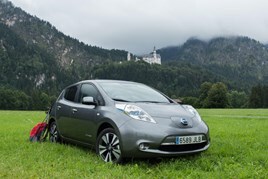 The fully-electric Nissan Leaf EV was the fastest selling used car in March, according to Motors.co.uk. Examples of the zero-emission model took just 21 days to sell via the online classified advertising platform, against an average of 39 days across the wider market. Dealers increased their used stocks in March 2019 but sold cars faster than they did 12 months ago. Despite the introduction of the new 19-plate, used forecourts were busy in March with dealers stocking an average of 66 cars, eight more than last year. Petrol was the fuel of choice for used car buyers, accounting for 52% of searches on Motors.co.uk from 50% of the total advertised stock, up from 46% last year. Petrol cars averaged 39 days to sell, the same as March 2018. As seen in previous months, there were also signs of consumer demand for diesel balancing better with supply. Whilst diesel’s share of the total stock advertised on Motors.co.uk dropped from 53% to 49% and vehicle views dropped from 48% to 46%, speed of sale improved year-on-year, with days in stock for diesels reducing from 44 to 40 days. “Despite competition from the new 19-plate the used market enjoyed a strong performance in March with average days in stock down to 39 days, a welcome month-on-month and year-on-year improvement,” said Dermot Kelleher, Motors.co.uk’s director of marketing and business intelligence. 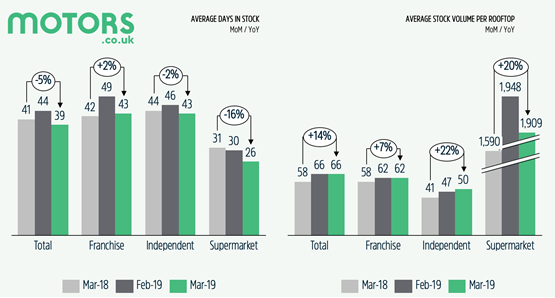 The fastest used car sales were achieved by supermarkets who averaged just 26 days, compared with the 43 days taken by independent and franchised dealers.